Yesterday, someone reminded me that I haven’t posted here for a while. I know. I said that I have no opinions at the moment. Which isn’t quite true, of course. If there’s anything many of us have too much of, it’s opinions — and many opportunities to express them, from a simple “like” to a 140-character tweet to a post at a blog. Sometimes there are a lot of us talking. But the real reason for the relative silence is that I’ve been pressed with other kinds of writing — a round of revision on my current novel project and preparing a talk I’m giving to a breakfast meeting tomorrow morning. I’m hoping to pick up the pace at my blog, however, during the next six weeks…. Lent begins — this Wednesday! — and this year our congregation is participating in a Lenten Guided Prayer called “Where do I sign?” written by Mennonite Spiritual Directors of Eastern Canada. It includes materials for Sundays as well as a guide for personal or small group reflection. I thought I might journal some of my reflections on the six-week exercise here. If you would like to come along, you will be most welcome. This week’s texts are Mark 1:9-15 (Jesus baptism/temptation/proclamation) and Psalm 25:1-10. 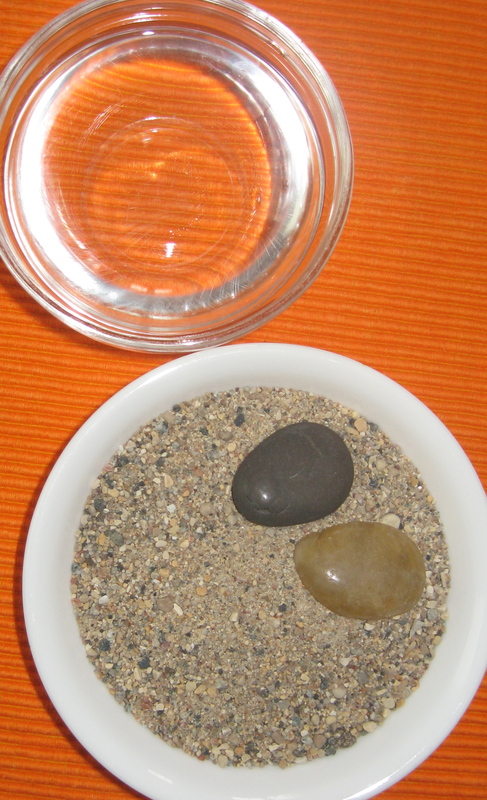 This week’s symbols wait in the place of prayer: a small bowl of water to remind me of Jesus’ baptism and a saucer with pebbles to remind me of the wilderness. The days lengthen and the time to journey approaches…. This entry was posted in spirituality and tagged Lent 2012, water and wilderness, Where do I sign by doradueck. Bookmark the permalink.